The lemon taste-alike of Asian cuisine, yuzu (Citrus ichangensis × C. reticulata) is a cross between mandarin oranges and Ichang papeda. This highly aromatic citrus fruit can withstand below zero temperatures and is an emblematic flavor of Japanese cuisine. Though used mostly for its strong, unique lemony fragrance, the fruit also boasts several interesting medicinal uses. Folk remedies recommend the use of yuzu for treating respiratory infections such as the common cold and associated symptoms such as a sore throat. The fruit is often used in combination with honey. Both the fruit pulp and its seeds boast potent antimicrobial properties. The fruit is a rich source of vitamin C and thus posseses excellent anti-inflammatory and antioxidant properties. Also, yuzu is rich in both hesperidin and naringenin, two flavanone compounds with several health benefits. What does yuzu look like? The yuzu-bearing tree is a thorny, upright shrub or medium-sized tree with lemon scented green leaves with slightly crenulated margins. It is native to East Asia. It was found growing wild in Tibet and Central China, but has been naturalized in Japan and Korea as well. Unlike other citrus trees, yuzu trees are frost resistant and can withstand temperatures of -8 to -10 degrees Celsius. The fruit is round, generally 5-7 cm in diameter, slightly smaller than a grapefruit, but can easily reach grapefruit size. It is a cross between mandarins and Ichang papeda. Yuzu trees blossom from April to May. The first fruit appear in June-August and generally ripen in November-December. Unripe yuzu fruit are green and have a hard, bumpy rind. The ripe fruit have a beautiful yellow color and a similarly bumpy, but loose, easy to peel rind. If left for too long on the tree, the fruit may turn slightly orange (thanks to its mandarin ancestry) or brown blotches may appear on its rind. It is possible for the fruit to have an uneven yellow-green color. The pulp is divided into segments that are easy to separate and may contain up to 30 large, cream-colored, teardrop-shaped seeds. What makes yuzu easy to peel is their thick albedo or pith, the soft, spongy white layer lining the inside of the rind. While the peel is rich in aromatic constituents, the pith contains important antioxidant flavonoids with a positive impact on our health. What does yuzu taste like? Both unripe and ripe yuzu are edible. All the yuzu fruit available nowadays have a distinct sour taste and a unique citrus flavor. Yuzu is tart, yet refreshing or sharp in flavor. It has a sort of grapefruit taste with hints of mandarin orange. Overall, the fruit is extremely aromatic, with a juicy, acidic, slightly bitter pulp and a strong lemony or citrussy perfume. A sweet yuzu variety called yuku existed in southern Japan a few hundred years ago, with specimens surviving up to this day. What is interesting though is that yuzu are not generally eaten as fruit in Japan, but rather used to season foods and enhance flavor (juice and rind). 1) Natural antimicrobial. According to research, p-methoxycinnamic acid, a constituent in yuzu seeds, boasts significant antimicrobial properties (Studies on Antimicrobial and Antioxidative Substance of Yuzu (Citrus junos hort. ex Tanaka) Seed. Journal of Biological Sciences, 2006). It is especially effective against Escherichia coli, Salmonella enteritidis, Micrococcus luteus, and Staphylococcus aureus, bacteria that cause food poisoning, favor various infections including septic shock, respiratory infections or skin infections. 2) Rich source of vitamin C. While eating the seeds is not customary, consuming fresh yuzu pulp and peel can contribute to good immunity due to the fruit’s high vitamin C content. It has been estimated that 100 g of ripe yuzu contains about 90.4 mg of vitamin C. The sour taste of the fruit if actually proof of its extremely generous vitamin C content. Research also shows that the riper the fruit, the higher its vitamin C content (Variation in major antioxidants and total antioxidant activity of Yuzu (Citrus junos Sieb ex Tanaka) during maturation and between cultivars). Both the pulp and the peel contain significant amounts of the nutrient. Vitamin C boosts immunity and helps protect against free radical damage and various forms of chronic disease such as cancer or cardiovascular disease. Even more, rubbing yuzu peel with chunks of pulp on the face is believed to help make it smooth and radiant. Folk remedies recommend eating fresh yuzu, drinking yuzu tea or adding the grinded peel to herbal teas in order to treat respiratory infections such as the common cold, flu and sore throat symptoms. 3) Promotes relaxation. Yuzu has an undoubtedly wonderful citrus fragrance and it is this strong perfume that helps reduce stress and promote relaxation. The smell of yuzu (and virtually any smell in the plant world) is actually the result of a combination of natural chemical constituents called volatile essential oils. Limonene, alpha-pinene, myrcene, sabinene, terpinene, terpinolene, isocaryopyllene, alpha-copaene, elemene and beta-selinene are some of the most prominent aromatic compounds in yuzu. For relaxation purposes, you can put one or two drops of yuzu essential oil in a diffuser (small device used to diffuse essential oil fragrances in a room) and let the machine spread the perfume while you smell it and relax. What I do is keep the peel of a yuzu fruit (orange or lemon) that I’ve just eaten and place it on a small plate by my bed or on my working table to enjoy its fragrance. While it may not seem much, aromatherapy is a simple and effective complementary treatment to help relieve tension and stress, relax and improve sleep. 4) Boasts antioxidant and anticancer properties. 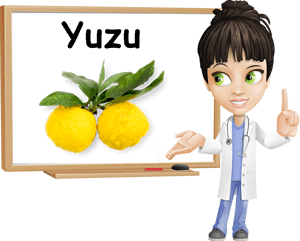 Yuzu are rich in potent antioxidants, notably vitamin C and flavonoids such as hesperidin, naringenin, rutin, narirutin, apigenin, quercetin and tangeretin. Aromatic constituents in the fruit such as limonene and other terpenes also boast antioxidant and anti-inflammatory properties. A wide range of scientific studies show these compounds to possess potent anticancer properties. Hesperidin, for example, boasts chemopreventive effects, while limonene and limonoids in general have a toxic effect on cancer cells, initiating a programmed death sequence called apoptosis. Yuzu as well as most citrus fruit (grapefruit, pomelo, oranges, lemons or limes) are all significant dietary sources of powerful antioxidants with noteworthy anticancer properties. Researchers have even advanced a theory that says the consumption of citrus fruit can help prevent various forms of the disease (Yano M. Cancer prevention by citrus, 2002). 5) Improves blood circulation and prevents blood clots. In addition to a warming effect following consumption, that is attributed to the fruit’s circulatory benefits, researchers have identified yuzu as a potential novelty fruit for the prevention of blood clots (Inhibitory Effects of Yuzu and Its Components on Human Platelet Aggregation). Studies show the fruit has an inhibitory effect on platelet aggregation, meaning it can help prevent the formation of blood clots and minimize the risk for cardiovascular disease, thus contributing to cardiovascular health. According to researchers, hesperidin and naringenin, two flavonoid antioxidants found in generous amounts in yuzu and other citrus fruit such as grapefruit are the ones responsible for the cardiovascular benefits of the fruit. 6) Good for skin. Eating yuzu on a regular basis, or any vitamin C-rich food to be honest, can have a rejuvenating effect on aging skin. This is because vitamin C initiates the process of collagen production. Collagen is the main structural protein in our body and is responsible, among other things, for the firm, wrinkle-free aspect of our skin. Moreover, yuzu seed extract has shown significant skin-whitening effects. Folk practices recommend rubbing yuzu slices on the face to make skin softer and more radiant. 1) Wash the yuzu well and pat dry with a paper towel. 2) Separate the peel (with the white part, the pith), pulp, juice and seeds. Place the seeds in a cheese cloth and tie with twine. 3) Discard the parts of peel with blemishes or dark spots. Cut the peel into thin slices. 4) To reduce bitterness, you can pre-boil the yuzu peel (with the white part, the pith) and, separately, the membranes (the pulp without the juice). Bring to a boil, then simmer for 10-15 minutes. Strain the contents. Alternatively, you can chop the yuzu membranes (this should help give the marmalade a finer consistency). 5) Weigh the ingredients (peel, membranes, juice). Measure half the amount of sugar. For example: 1 kg of yuzu requires about 500 g of sugar. You can always add more sugar if you’d like it to be sweeter. 6) Proceed to actually making the marmalade: add the yuzu peel, membranes, juice, seeds in the cheese cloth, sugar and cover with water. Boil on low heat with the lid on at first, but stir frequently to prevent the contents from sticking to the bottom. Meanwhile, slightly chill a spoon or a small plate in the freezer. 7) It should take around half an hour to 40-45 minutes for the marmalade to be ready. You’ll notice the contents becoming thicker, at which point it’s a good idea to try the marmalade to check if it has the consistency you want. The marmalade should slowly slide of the chilled spoon or plate. Remove from heat, discard the seeds and place the marmalade in jars and can using the hot water bath canning method. Properly canned yuzu marmalade can easily last about a year. Enjoy!